The Jet Express is a safe, ocean-approved catamaran offering passengers a choice of all-weather protected, indoor seating or a refreshing open air ride. 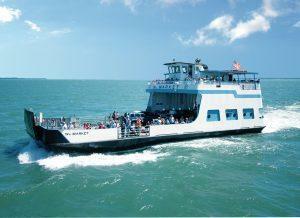 Traveling at speeds of more than 40 mph, it offers the smoothest, fastest ride across Lake Erie to Put-in-Bay Island. On your way you’ll pass seven Lake Erie Islands, catch up on Lake Erie and South Bass Island History and travel shore-to-shore from Port Clinton to Downtown Put-in-Bay Ohio. Lake Erie’s most popular Ohio island destination and family fun spot. Similarly, take the Jet-Express to Put-in-Bay Ohio and visit this beautiful Ohio Resort. The Only Way To Put-in-Bay with a vehicle! During peak summer season Put-in-Bay trips begin as early as 6:30 am and depart Catawba as late as 9:30 pm with trips every half hour. Quite a change from 1946 when ferries departed for only three trips from Catawba. Miller Boat Line is the only scheduled ferry service to Middle Bass Island from the mainland. 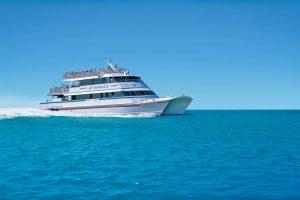 Miller Boat Line continues to add services and provide values for its customers: Budget-friendly fares, season passes to Put-in-Bay and Middle Bass, frequent floater tickets, season parking, group and student fares, free parking and island packages. Therefore, they proudly support several non-profit and community organizations and events on Put-in-Bay and neighboring mainland communities. Miller Boat Line is the proud sponsor of the tall ship “Niagara” for the Battle of Lake Erie Bicentennial Celebration 2013. The ferry service operates because of the devotion of all who work there; the people that sell car and passenger tickets, gift shop/information ladies, dock personnel, freight handlers, women that run the office operations and answer the phones, security, Captains, diligent deck hands and maintenance men sent to repair things at a moment’s notice. Furthermore, about 95 five people are employed by Miller Boat Line during peak season. They each lend to the boat line’s reputation of being the most frequently traveled and largest ferry service on Lake Erie. The favored way to fly to the Bay from Sandusky! Griffing Flying Service offers Scenic Aerial Tours departing from the Erie-Ottawa International Airport. Get a birds-eye-view of all the landmarks in the area with our different tour options! Griffing Flying Service offers one-way and round-trip flights to all Lake Erie Islands – South Bass/Put-In-Bay, Middle Bass, North Bass, Kelleys Island, Rattlesnake (Private Island), and Pelee Island in Canadian waters. 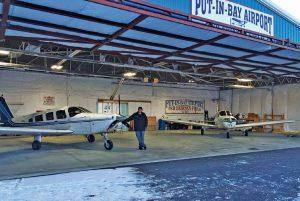 All Lake Erie Island flights depart from and return to Erie Ottawa International Airport in Port Clinton, OH. Griffing Flying Service offers air charter service to and from any airport in the US and Canada, with limited service to the Bahamas. Depart on your schedule, skip long check-in lines, and have an aircraft at your personal service. Finally, executive air charter is possible with advanced aircraft that are maintained to, and beyond, the highest FAA standards. All charter flights are crewed by fully certified professional pilots; providing you with a safe, comfortable and convenient ride. Also, Griffing Flying Service has earned the reputation as an aviation industry expert across the Midwest. Having been in business for nearly 80 years, we have a wealth of experience and knowledge that you can trust. Our staff prides themselves as being the most attentive, knowledgeable, and helpful source around. Harry Thomas Griffing, Sr. and his wife Sue founded Griffing Flying Service in 1937. 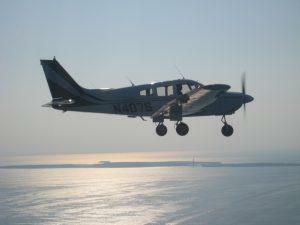 The favored way to fly to the Bay from Port Clinton! Island Air Taxi is a new option for air travel to and from the islands. Based at Put in Bay Airport and providing air service for South Bass, Middle Bass, North Bass, Kelleys Island, and Port Clinton at $40 each way. In summary, fly in a Piper Cherokee Six with Club Seating that can carry five passengers or cargo. Flights can be scheduled from sunrise to sunset, seven days a week, year round.